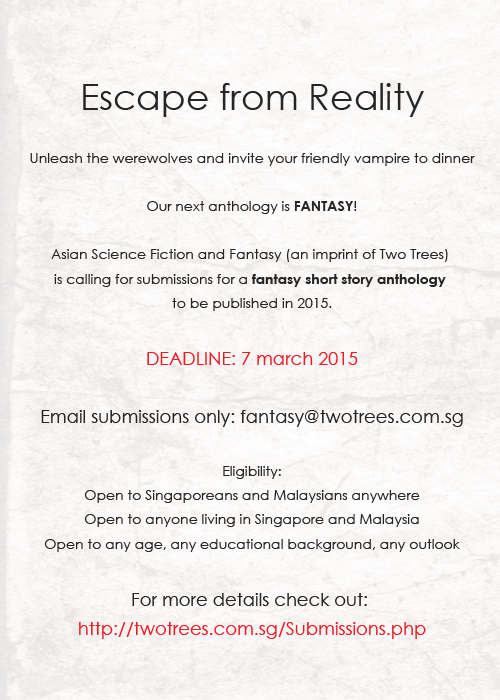 Asian Science Fiction and Fantasy (an imprint of Two Trees) is calling for submissions for a fantasy short story anthology to be published in 2015. GUYSSS. Always saw those tumblr prompts or wanted to write a story with them? WELL. You should try it for this. Also… yes. Any ‘outlook’ is our code for WRITE WHATEVERS YOU FEEL and by any outlook, you should know what I mean. Your characters can like anything or anyone they like as long as it makes sense. Anything as long it is FUN to read. That’s our criteria. It better be entertaining and fun and not with IN YOUR FACE agenda. It can have the message inside but no blatant ones because the main thing is that the story has to be engaging read. Do look through the pdf in the fine details, it’ll tell you how to submit your story. Basically, when you’re feeling down. Or bored and you want to read something that takes you away from all this. That’s what we’re looking for. Write something that takes you away somewhere else. It can be urban fantasy, fantasy fantasy, high fantasy, soft fantasy. Just… just take us away, ok? Well, have Dawn with a bunch of vegetables. And… this is going to be the super short version of a longer post I’ll have in the week but we’re OPEN to submissions for a FANTASY ANTHOLOGY. Click here to check it out and download the details. If you read this sentence, good on you. Because hohohohohohoh, this anthology is gonna be woah. Since I keep seeing it in my keywords searching more about the Singapore steampunk anthology by Two Trees… Here’s a public update! The non-acceptances have been emailed out with comments and the rest have been updated that they’ve passed through the first round! At the moment, we’re sorting through which stories will fit together in the whole anthology since there ARE quite a lot! The results of that will most probably get through after New Year’s and then we’ll email once more who got through the final cut! From then onwards, we’ll note to them which parts need editing if they need, etc. So yes, submissions are closed but we’re still working on it to get it all together! Posted on December 13, 2010 Categories The LiteraryTags The Literary, two trees, writingLeave a comment on Singapore Steampunk Anthology: Update! Submission call for Steampunk short stories! Hello everyone! Remember Happiness at the End of the World? If you don’t, it’s the science fiction anthology we came out with next year. This time we’re opening submissions for steampunk short stories! 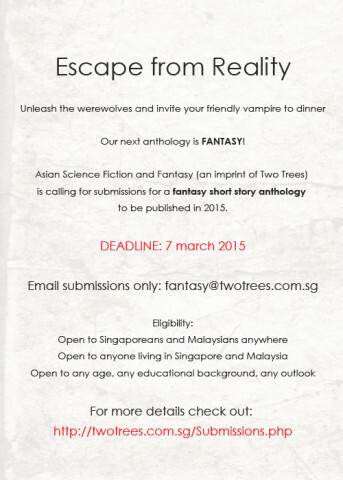 Asian Science Fiction and Fantasy (an imprint of Two Trees) and The Happy Smiley Writers Group are calling for submissions for the second in their sci-fi short story anthology series. Following on the success of their first anthology, Happiness at the end of the World, Happy Smiley and Friends are going Steampunk. 1) Theme is science fiction steampunk with a happy ending. 2) Word length between 2000 and a firm 6000 words. 3) Deadline for submissions is 31st October. Continue reading Submission call for Steampunk short stories! 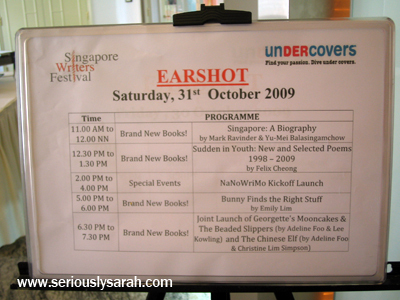 Posted on August 10, 2010 August 11, 2010 Categories The LiteraryTags book, singapore, story, two trees, writingLeave a comment on Submission call for Steampunk short stories! Happiness at the End of the World!! YEAH, YEAH! Finally! Our book is in stores! Or rather, I finally saw it in Kinokuniya Orchard with Mintea! It’s Happiness at the End of the World (HatEotW)! 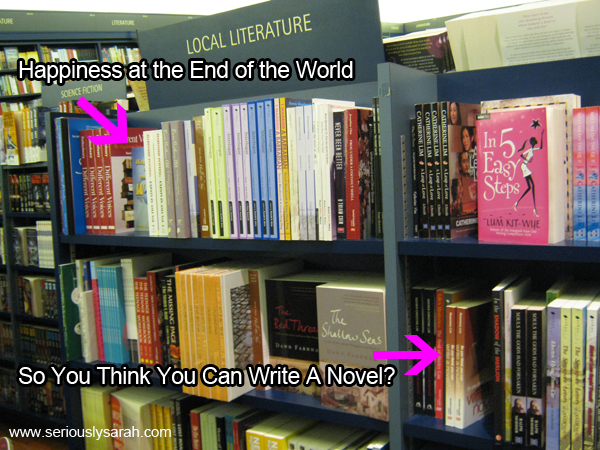 Amusingly, if you want to read our previous 2007 anthology, “So You Think You Can Write A Novel?”, it’s there too. Don’t know what HatEotW is about? It’s a science fiction anthology of 8 short stories (by 8 writers) based around the theme of the end of the world! Even if we were given the same theme (yes, I’m one of the writers in the book! ), all of the stories vary from each other and we noticed that amongst those who bought the book during the book launch last year, everyone had a different favourite story out of the lot. As for So You Think You Can Write A Novel?, it’s not a self help book but more an anthology of 18 stories by 18 writers of different genres and said stories are from their own novels. BUT ENOUGH ON THAT, let’s focus on the latest book first! Oh, here’s a book trailer if you haven’t seen it yet. It’s simple but to the point. 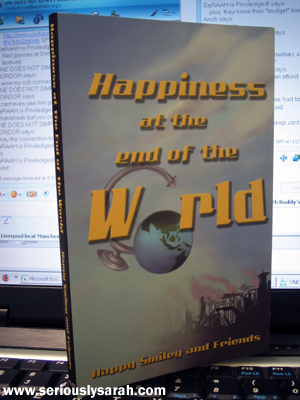 Continue reading Happiness at the End of the World!! Posted on February 2, 2010 February 2, 2010 Categories The LiteraryTags book, two trees, writing5 Comments on Happiness at the End of the World!! First up, yes. Our book is published! You can buy it online here. Currently, since it just got printed and all, it will take quite a bit of time before the distributors would distribute the copies into the various bookshops here (may be in the coming weeks). If you’re wanting the book now, then it’s best to just order it online first from Two Trees, the publisher. Quick summary, 8 short stories, set at the end of the world but with happy endings. Press release found when you click on the above links. It’s a very interesting compilation by the way! I’m not saying that just because I’m one of the writers there but because I went “Ooooh!” at the other stories too. Now onwards to Singapore’s NaNoWriMo kick-off! Ours was 2pm but we came around 1.30pm YET, the cafe was filled with people. Some of them Nanowrimo-ers too. Uugh, uugh! It was slightly crowded so we hurried and set up our signs, books and goodie bags. We didn’t want the guests to wait too long even when it wasn’t yet our session! Yesterday was St Patrick’s Day and I chanced upon Rozen aka Rosemary at the parade while I was helping the Jedi in the Star Wars contingent record stuff. 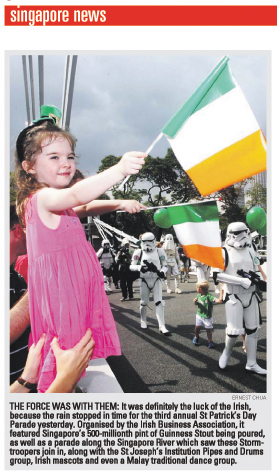 Technically, if you were there, you might notice me in this here picture (page 6, 17 Mar 08, Today Paper). Well, I suppose not really unless you zoom in but I was lugging camera equipment around in the background. Ten minutes before the parade started, I called out to her for a hello and all and then… GASP! 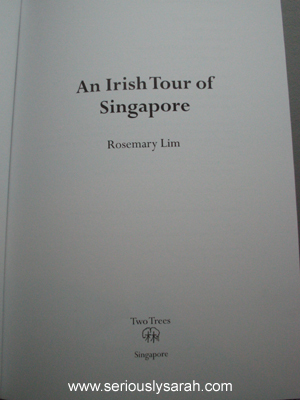 An Irish Tour of Singapore, published by Two Trees, her book was finally done! AND it’s published by Two Trees aka HER publishing company. What surprised me most was that it was a HARDCOVER book. Frankly, how many hardcover books have you seen printed for local books? Not many right? (Books meant for literature class don’t count since those are for students who’re rough on them.) Or they might mostly be for children’s books too… as it is, it’s NOT often! The paper quality is pretty nice too, smooth and white since there are also pictures printed in it to reference the historical events that has happened. Although it IS pretty much a history book of sorts, talking about the Irish in Singapore, for some reason, it doesn’t really feel like it. It didn’t feel as boring as some other books I’ve read (for history) and somehow… the writing is sassy. Maybe it’s because I know the writer or the subject matter of the book but in all, it feels upbeat and you’d go “Woah” over the facts in it. For instance, I did not know a lot of the roads I’ve been to around Orchard and such are named after Irish people!! Heck, I didn’t even know “Killiney” was Irish. The name only brought “Coffeeshop” in my mind because of the famous coffee and toast around there. The history it brings makes you realize there’s a lot of Irish in Singapore and the contributions they did in building up the country! There’s a slight moment on page 59 of the book that hit me as the chapter was about the Catholic Brothers and Sisters coming to set up the schools and teach people here in Singapore (St Joseph’s and CHIJMES for instance). You learn that these people really, REALLY want to help the people back then in giving education, medical help and all. There was one line too about one of the Sisters marrying the captain of the ship (this is legal back then since it wasn’t in their vows and whatever so she wasn’t breaking anything) AMIDST THE BACKGROUND OF TURBULENCE AND PASHIIOOONE. So not really much on the passion but the book described the journey from where they came to Singapore was not an easy one. They had SHIPS back then and STORMS and fevers and stuff! And to think they’d travel all the way through the hardship to just give the people back then education, help, Churches and etc. 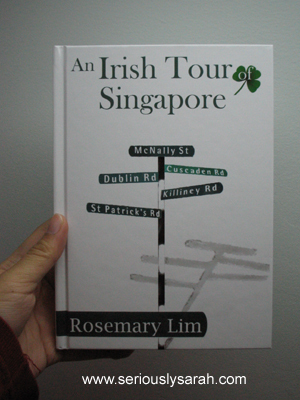 This book has pictures and pretty much a LOT of info on the Irish from the past till the present in Singapore. In fact, page 109 made me snort in amusement because the writer had written about herself winning the Singapore Literature Prize Merit Award under the chapter about the arts, culture and media. This is true (she’s Irish!) but I could imagine her saying “HAH!” or “Me, me!” while writing this bit. Me thinks, if I get to know more writers and read their books, I’ll start to have a mini commentary in my mind on how they write or something. If you’re a history buff or need research or inspiration about the past, go pick up the book! The official launch is in June so I’ll probably post a reminder till then. When it comes out, it’ll be available in major bookstores and possibly Amazon too, so hold on until it’s properly released! It’ll also be on sale at their website.